AE analysis has been used with standard artificial sources and events caused by loading. Specimens differed considerably in shape and size. Results depend on the applied filter criteria but allow the determination of attenuation rates and wave propagation velocities as well as to show the evidence of both Kaiser effect and Felicity ratio. The accuracy of the localization of AE events depends on the methods and on the quality of picking. Localized events show a good coincidence with expected or observed cracks. The comparison of wave forms shows the dominance of propagation conditions over other potential reasons for differences. More refined methods like moment tensor inversion are treated by reference only. Conclusions and an outlook show the need for further research and the paths that may be followed. Acoustic emission (AE) analysis is a well established method to evaluate steel and fiber reinforced polymer structures like silos and tanks non-destructively. For concrete, however, more difficulties arise, due to the complex character of the material. 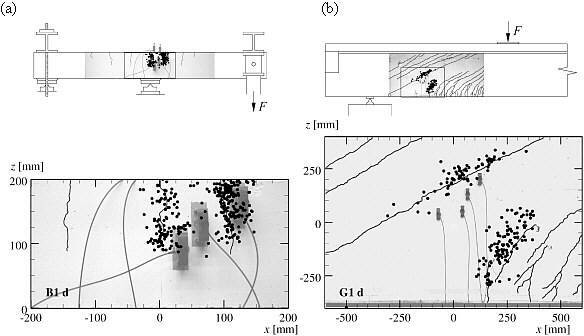 The grain boundaries of the aggregates as well as the entrained air lead to reflection and diffraction of the elastic waves, causing an attenuation that limits the operating range of sensors considerably. Reinforcement bars and post-tensioning tendons that are part of real structures further complicate the propagation paths and cracks can impede them. Nevertheless, AE analysis promises to become a valuable tool also for concrete structures, provided that these difficulties can be overcome by a clever test layout and an appropriate data processing. As part of a PhD thesis the following tests have been executed at ETH Zurich between 1998 and 2001 .
the attenuation rate along a concrete beam up to a length of 2'200 mm. the propagation velocity of p-waves within a concrete cube with side lengths of 200 mm. the influence of the angle of incidence on the surface motion on a semicircle shaped prism. the localization of AE sources and its accuracy in concrete cubes with and without embedded rebars. Figure 1 shows the used specimens with principal dimensions and the scheme of source and sensor location. Fig 1: Tests with artificial sources and associated receivers , (a) attenuation rate, (b) propagation velocity, (c) angle of incidence, (d) accuracy of localization. The main purpose of structural evaluation is to anticipate the behavior of structures subjected to loading. The tests executed covered the whole range from standard tests used for quality control of materials (split by double punch, pull-out tests) to tests up to failure of structural elements and whole structures (three point bending). Figures 2 and 3 show the test set-ups with the principal dimensions and the applied loads F depending on the time t and the deflection w. In the first beam test series the sensors were concentrated in the tension area above the intermediate support and in the second in an area subjected to high shear forces. Fig 2: Tests with concrete cubes subject to loading; (a) double punch, (b) pull-out. Fig 3: Tests with reinforced concrete beams subject to loading; (a) symmetrical three point bending, (b) asymmetrical three point bending. With AE the interpretation of test results also involves the data acquisition, because not all signals can be recorded and the setting of threshold values, page length etc. is quite subjective. Figure 4 shows how the choice of the threshold value UT influences some AE parameters. In  all these prerequisites are described. Preliminary results have been published in  and  and all results can be found in full detail in . Fig 4: Influence of variations of the threshold value UT on AE parameters C, D and R; (a) transient signal, (b) counts C of AE events, (c) duration D of the signals, (d) rise time R of the signals. Attenuation i.e. the reduction in amplitude of AE signals along the propagation path has different contributions. The geometric divergence is caused by the enlargement of the wave front at a constant energy content. It can be calculated taking into account the wave front's shape, being spherical for internal and cylindrical for surface waves, respectively. For heterogeneous materials like concrete additional attenuation due to dispersion at internal interfaces and dissipation of energy occurs. It depends on material properties and frequency content and can be quantified empirically only. Figure 5 shows single results of own tests with a linear regression and regression lines proposed by others , , , . The first peak amplitude of the signal Up is caused by the p-wave (Fig. 5 (a)) while the maximum amplitude Umax normally has its origin in the surface wave (Fig. 5 (b)). Differences between indications of the authors can be explained by the different concrete used, the different frequency ranges and the test set-up that causes problems to quantify the geometrical divergence unambiguously. Fig 5: Attenuation of wave amplitudes corrected by spherical and cylindrical divergence. Solid line: results of own tests; dotted lines: results from the literature. (a) p-wave amplitudes, (b) maximum amplitudes. As visible in Figure 5 p-waves are damped within the first meter and for longer distances surface waves become dominant. For both wave types propagation velocities were determined. According to the elastic wave theory propagation velocities only depend on the density r, the modulus of elasticity E and Poisson's ratio n. The difficulty is to measure a dynamic modulus of elasticity that can differ considerably from the static one which is normally used and to take into account inconsistencies in density like pores. Fig 6: Determination of the propagation velocity of p-waves (a) between source and sensor, (b) between two sensors, (c) test set-up. Qualitative analysis applied to AE from load tests (Fig. 3) shows effects known from other materials. AE activity increases when a previously reached load level is surpassed (Kaiser effect, Fig. 7 (a)) but, as a matter of fact, it starts a little earlier (Felicity ratio, Fig. 7(b)). Fig 7: Qualitative AE analysis for pull-out test A4; (a) propagation of applied load F and signal rate R over time,(b) applied load F depending on the accumulation of AE events N.
Localization of signal sources in space is possible for signals that reach four sensors. When an event is recorded by more than four sensors, statements on the accuracy of the localization are possible. Precondition of localization is an accurate picking, i.e. the determination of the arrival time of the p-wave. The simple picking methods used in commercial AE-software can be improved by an automatic post-processor that considers waveform, signal energy and noise condition , , . Although time consuming and subjective manual picking still gives the best results (Fig. 8). Fig 8: Comparison of localization algorithms of a pull-out test (black dots: reliable, gray dots less reliable); (a) first exceeding of threshold value, (b) postprocessor WinPecker, (c) manual picking. Most of the localized sources coincide well with the regions where cracking occurs (Fig. 9 and 10). Displaying the source locations as a density distribution shows even more details like the orientation of the ribs of the rebar (Fig. 9 (b)). As soon as the crack width surpasses 0.2 to 0.3 mm AE activities decline and the cracks become a barrier for wave propagation (Fig.10(b)). Fig 9: Localization of AE-events for a pull-out test; display alternatives: (a) events as dots, (b) density distributions of events. Fig 10: Localization of AE-events for beam tests, concentration of events at cracks; (a) symmetri-cal three point bending, (b) asymmetrical three point bending. Wave forms were analyzed by transferring the signals into the frequency domain and were compared by calculating the magnitude-squared coherence function proposed by Carter et al. . This function is averaged over the frequency range from 30 to 300 kHz in order to quantify the similarity of two waveforms by one single value C.
AE events were represented by a set of waveforms recorded by up to eight different channels of the acquisition unit. To determine the similarity of two AE events, C was calculated for every channel and subsequently averaged. AE events with a distinctive similarity have high C-values on all channels (low standard deviation in Fig. 11 (a)). Therefore C is assumed to be a reliable value for the similarity of AE events. High similarities are only observed with AE events whose source locations are in close vicinity. This suggests that the propagation conditions determine the waveform and other potential influences like failure modes are hidden and can hardy be distinguished. Fig 11: Calculated similarities C to two reference events in a pull-out test; (a) sum curve of 335 AE events, (b) spatial distribution of similar events. Using moment tensor inversion the mechanical characteristics - crack orientation and slip vector - of AE sources can be determined. More details are given in . Evaluation and implementation of more powerful picking algorithms to facilitate the localization and to automate the search for high quality signals which justify further treatment. Simulation of wave propagation in multi component materials like concrete to judge e.g. the potential of test arrangements and the optimal position of sensors. Look for test situations in both laboratory tests and structures in use that are worth considering the application of AE analysis and give new impacts to the development. The authors are grateful for the fruitful collaboration with the Institute of Construction Materials of the University of Stuttgart, especially Dr. Christian Grosse. The financial support of the Swiss National Science Foundation is acknowledged. Köppel, S. and Vogel, T.: Schallemissionsmessungen bei Versuchen an Stahlbeton (Acoustic emission analysis applied at tests with structural concrete). IBK report Nr. 259; Institute of Structural Engineering ETH Zurich; Nov. 2000, Birkhäuser Basel; 164pp. Köppel, S. and Vogel, T.: Localization and identification of cracking mechanisms in reinforced concrete using acoustic emission analysis. Proc. 4. Int. Conf. on Bridge Management, Surrey (2000), pp 88-95. Köppel, S. and Grosse, C.: Advanced Acoustic Emission Techniques for Failure Analysis in Concrete. Proceedings, 15th World Conference on Non-Destructive Testing, Rome, Oct. 2000, CD-ROM, idn231. Köppel, S.: Schallemissionsanalyse zur Untersuchung von Stahlbetontragwerken (Acoustic emission analysis for the evaluation of concrete structures). IBK report Nr. 272; Institute of Structural Engineering ETH Zurich; Feb. 2002, vdf Zurich; 174 pp. Berthelot, J.M. ; Ben Souda, M.; Robert, J.L. : Study of wave attenuation in concrete. Journal of Materials Research, Vol. 8, No. 9; The Materials Research Society, 1993; pp. 2344-2353. Grosse, C.U. : Quantitative zerstörungsfreie Prüfung von Baustoffen mittels Schallemissionsanalyse und Ultraschall (Quantitative non-destructive testing of materials with acoustic emission analysis and ultrasonic). PhD thesis, Stuttgart University, Stuttgart 1996; 168 pp. Landis, E.N. : A quantitative acoustic emission investigation of microfracture in cement based materials. Northwestern University; Evanston 1993; 185 pp. Ohtsu, M.: Acoustic emission characteristics in concrete and diagnostic applications. Journal of Acoustic Emission, Vol. 6, No. 2; Acoustic Emission Working Group AEWG, 1987; pp. 99-108. Grosse, C. and Reinhardt, H.: Entwicklung eines Algorithmus zur automatischen Lokalisierung von Schallemissionsquellen (Development of an algorithm to localize AE sources automatically). Die Materialprüfung 41 (1999), pp. 342-347. Grosse, C.: WinPecker - Programm zur vollautomatischen dreidimensionalen Lokalisierung von Schallemissionsquellen (Program for the fully automatic three-dimensional localization of AE sources). 12. Kolloquium Schallemission, DGZfP proceedings BB 72 (2000), pp. 191-204. Carter, G.C. ; Knapp, C.H. ; Nuttall, A.H.: Estimation of the magnitude-squared coherence function via overlapped fast fourier transform processing. IEEE Transactions on Audio and Electroacoustics, Vol. AU-21, No. 4; 1973; pp. 337-344.